Tags : Fishing Report Fluorocarbon Fishing Line 50lb bullbuster braid bullbuster mono tarpon miami Coral Gables FL Fishing Spring Tarpon Fishing Spring Tarpon Fishing Miami Tarpon Fishing In Miami Best Time Of Year To Catch Tarpon In Miami Night Time Tarpon Miami Mullet Live Bait Fishing Florida Fishing South Florida Fishing Report Tarpon Tarpon Fishing Fishing For Tarpon Silver King What Is A Silver King? Hands down, this is my favorite time of year to fish in South Florida. 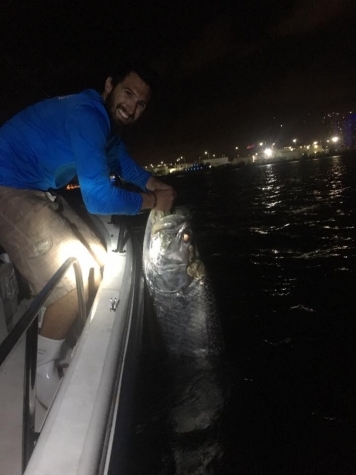 All the species you are able to catch in Miami throughout the year seems to all cross ways here during the months of April/May. 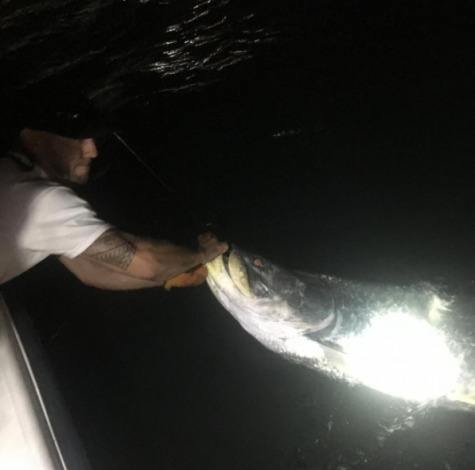 Whether it be Big Tarpon and Permit inshore or Big Dolphin, Tunas, and Sailfish offshore you have a really good chance at catching something when you are out there. 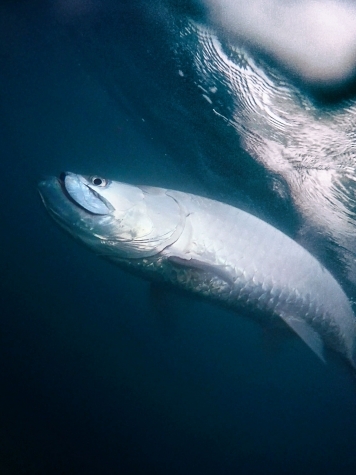 The highlight for me has to be the Big Tarpon that hang around to feed on the Mullet after filling their bellies with the Wintertime Shrimp. These fish are large and have quite an attitude problem. They are very aggressive on the baits and that leads to some really cool bites. If you have never fished with Mullet before it truly is something to see. 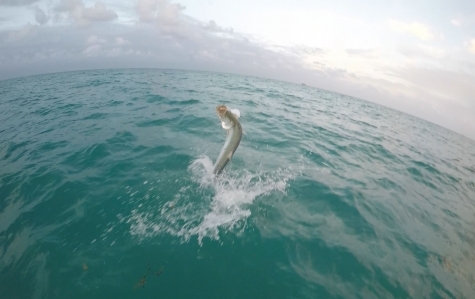 Sometimes the Tarpon will play with it like a cat before it decides to eat. Itll toss the mullet in the air and chase it around in circles before taking it. Sometimes they do this and don't even take the bait which can be pretty heart-wrencing to watch. 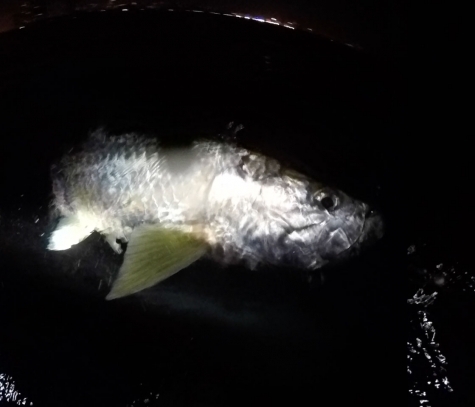 Last night I went out with a buddy (@teamgooganofficial) with a livewell full of Mullet ranging in size. Within a few minutes of arriving at the spot we had our first bite. The fish missed the mullet the first few passes. I slowly started reeling on the bait restricting its maneuverability and sure enough the fish came back and inhaled the bait. I let him eat for a few seconds to make sure he had it and when I locked it up the fish came out of the water with some of the most impressive jumps I have ever seen out of a Tarpon. 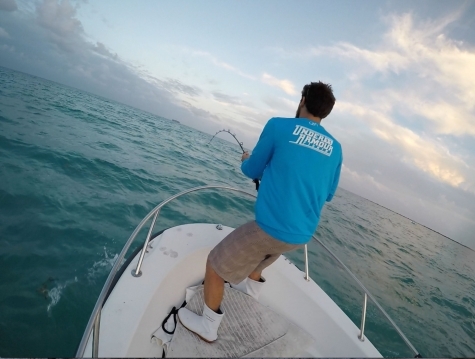 Like a billfish he launched from the water and headed straight towards the boat in a series of jumps. I struggled to stay tight but was able to keep the fish on. 15 minutes later we landed the 60lb fish. 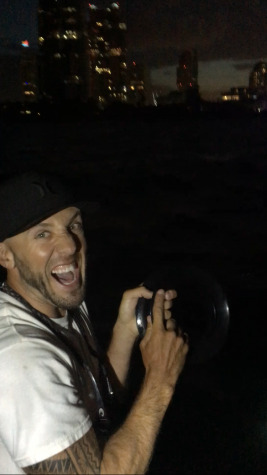 Before dark we hooked 4 more in the same spot slow trolling the mullet over the same hole. Each one of them ended up throwing the hook but not before getting a few good jumps out of them. We even hooked one on a YoYo we fought for about 10 minutes before he threw the hook. Now that was a sight to see! After doing 2 more passes without a bite we moved onto the next spot. Within 5 minutes I jumped one off and my had another bite. We reset and I was able to stick a smaller fish in the 30lb range. My buddy got a bite too and we were doubled up! His ended up being a small blacktip and I got the release on my fish. I tossed the bait out and started working the area. Before my buddy could even get his bait out my bait got slammed. Usually you can tell when you are about to get the bite because the mullet starts to get nervous and move around. This bait must have had no idea what was coming because the fish just started ripping line out of my hand. 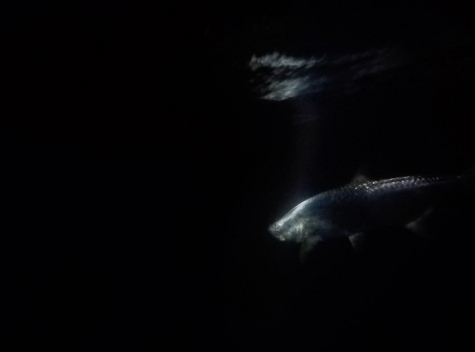 I fed him for a few seconds and when I went on him this silhouette of a fish came flying out of the water blocking the light coming off the Miami skyline. We couldn't quite make out what it was but because of its girth and the way it jumped thought it might had been a big blacktip. The fish made a screaming run and made it .2 miles away in about 10 seconds. We got on top of him and the battle started. The fish stayed deep which was really making us think shark because he never came up for another jump. I was considering breaking it off to get back on the Tarpon I have see this before with the Tarpon. Sometimes they just don't jump. About 25 minutes into the fight he came up for his first gulp of air and we were able to get a decent look at him. 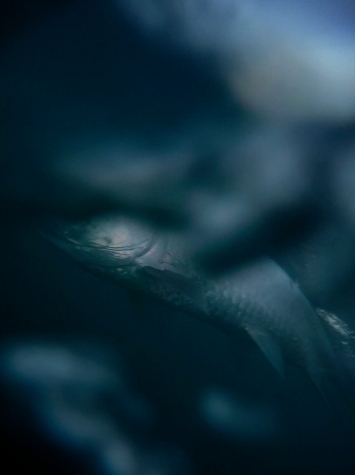 The fish had some of the broadest shoulders I have seen on a Tarpon. He never jumped again throughout the fight but he did come up to gulp air 5 times before we were able to get our hands on him. In order to get the fish boatside I had to lock down the drag. Between that and some gentle palmming on the spool at the appropriate time I coaxed him up. This is where the Bullbuster line really shined. I dont think I have ever put so much heat on a fish. My spinner is loaded up with 30lb Bullbuster Braid backing, 40lb mono top shot and a 5ft piece of 50lb Bullbuster Flourocarbon attached with a loopknot to a circle hook. I truly put the tackle to the test last night and thanks to Bullbuster was able to land the fish. This fish measured out at 69" long fork length and had a 39" dorsal girth. It is estimated to be 130 pounds. Was a great night of fishing with a good buddy and I cant wait to get out there again soon!